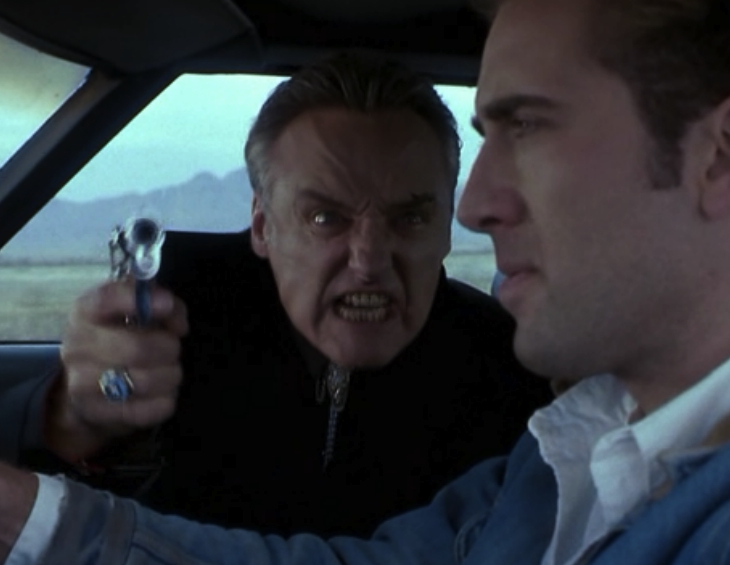 Dennis Hopper plays a lunatic (what else is new) opposite Nicolas Cage in "Red Rock West." Red Rock West has all the depth of a fine crime novel, and John Dahl is a good storyteller, but the movie is bogged down by stiff acting and predictable dialogue. The story is routine –a case of mistaken identity. A drifter named Michael (Nicolas Cage) wanders into a town called Red Rock, looking for a job. He is greeted by the bartender, Wayne (J.T. Walsh), who mistakes him for someone else. “You must be Lyle, from Dallas.” Michael, in need of money, takes Wayne up on the offer. Soon, Michael learns the details of the job — He has been hired to kill Wayne’s wife, Suzanna (Lara Flynn Boyle), for Wayne thinks she is being dishonest. Michael drives out to the ranch, only to be convinced by Suzanne that if he doesn’t kill her and kills Wayne instead, she’ll pay him double. Michael accepts. So, Michael takes the money and tries to skip town. A thunderstorm hits and not soon after, Michael hits a man on the side of the road, accidentally. Frantically, he carries the wounded man in his car back into Red Rock, to the hospital. At the hospital, Michael’s alibi isn’t so good and the sheriff is called in. Oddly enough, the sheriff turns out to be Wayne himself, and he takes Michael outside the city for an execution. But Michael somehow manages to escape and flags down an oncoming car. The driver lets Michael in and the two head back into Red Rock to have a drink. And who else could the driver possibly be but Lyle, from Texas. Sure, just from reading the synopsis on Red Rock West, I’m sure that you would be interested. Hell, that’s what got me so intrigued. But it’s really just nothing. It may carry all of the typical traits that classic film noir does, but it can’t pull any of them off. You’ll grin a couple times at the twists and turns that the film takes, but displeased by what happens after them. See, Dahl knows how to tell a story, but not how to show it. All of this seems grand on paper, but when you put it up there on the screen, it unfolds rather blandly. Also, the acting isn’t anything special. Everyone seems pretty stiff. There isn’t any hidden meaning behind anything in Red Rock West, so you’re forced to rely on the actions and reactions of the characters. And when they don’t quite pull through, what do you turn to then? There is one good thing though. Dennis Hopper does have a rather great performance as Lyle. He’s great at playing lunatics, in the “villain” sense of the word. He can really get you convinced that he’s crazy and here, with that maniacal expression plastered on his face half the time, I was really sold. But that’s about it. Red Rock West, despite the numerous positive reviews, is disappointingly average.